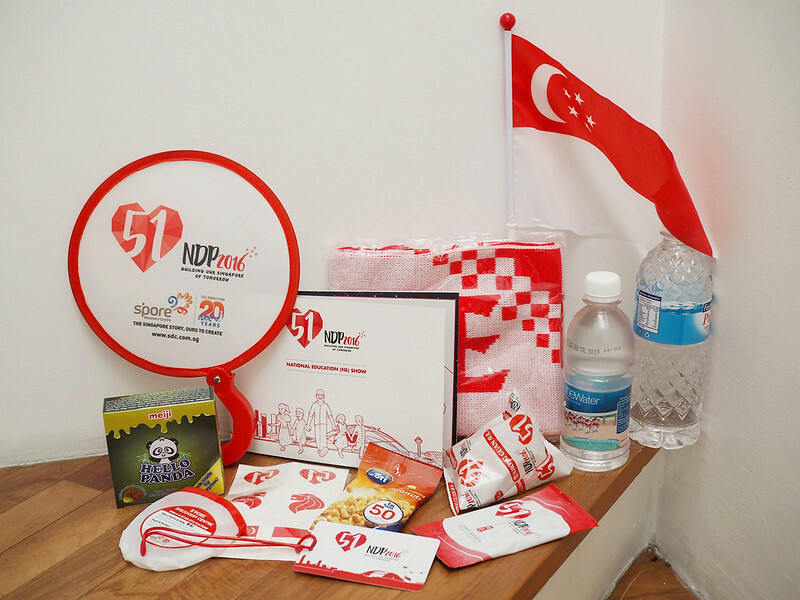 SHENNYYANG - Singapore's Lifestyle & Travel Blogger: NDP2016 Funpacks! 2 weeks ago was the unveiling of the NDP2016 Funpacks and boy was I lucky to be one of the first to bring home the funpacks!! 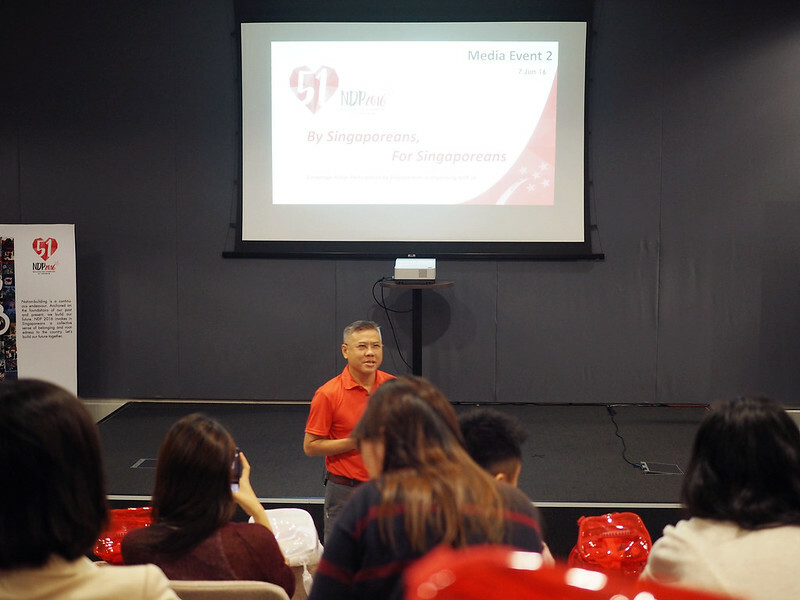 Alongside with some of my fellow nuffies and other media personnel, we attended the media event to learn more about the various engagements initiatives leading up to NDP 2016 and of course, the design of the NDP 2016 Funpack and its contents! During the event, we also had to chance to see a sample of the mural named "Our Collective Dreams and Aspirations". "Our Collective Dreams and Aspirations encourage students and youths to share their dreams and aspirations for Singapore’s future through painting. 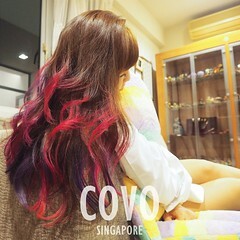 The use of creative expression – in particular, abstract art which permits free and limitless expression – aims to stretch the imagination of Singaporeans in dreaming of a better future for Singapore. Under this initiative, more than 50,000 individual paintings will be digitally stitched together to form a large mosaic. This stitching of the individual paintings together symbolises the need for collective ownership in charting Singapore’s future. Renowned Singaporean artist, Mr Sun Yu-Li, will create abstract designs based on each of the 51 years of Singapore’s nation-building and overlay them atop the mosaic. The resulting Our Collective Dreams and Aspirations thus represent the collective journey of our nation over 51 years." 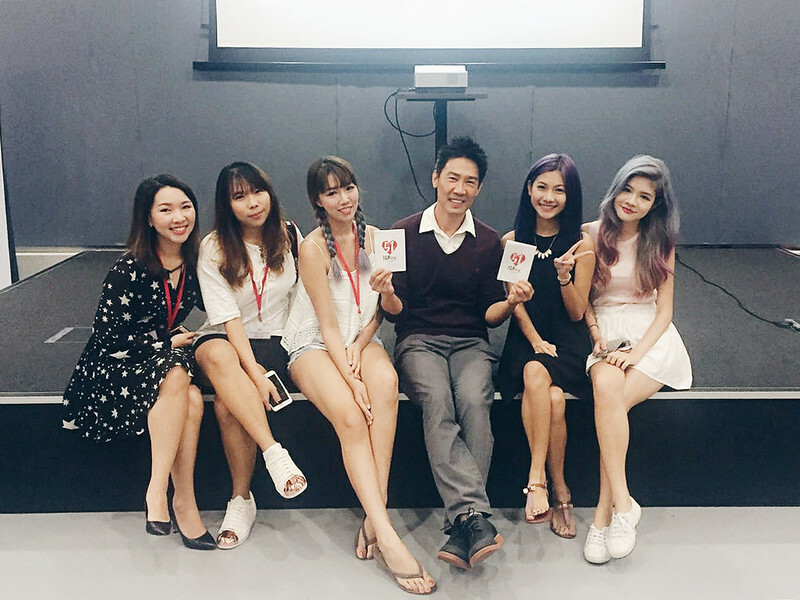 During the event we also got a chance to see former TV artiste, Mr Edmund Chen!! "Our Pledge to Singapore is a collaborative effort by Mr Edmund Chen, and children with special needs from Pathlight School as they co-design this year’s Pledge Card. Through drawings by Mr Chen and the Pathlight School students which depict the past, present and future of Singapore, the Pledge Card celebrates the artistic talents of children with special needs and showcases their unique perspectives of what it means to be Singaporean. 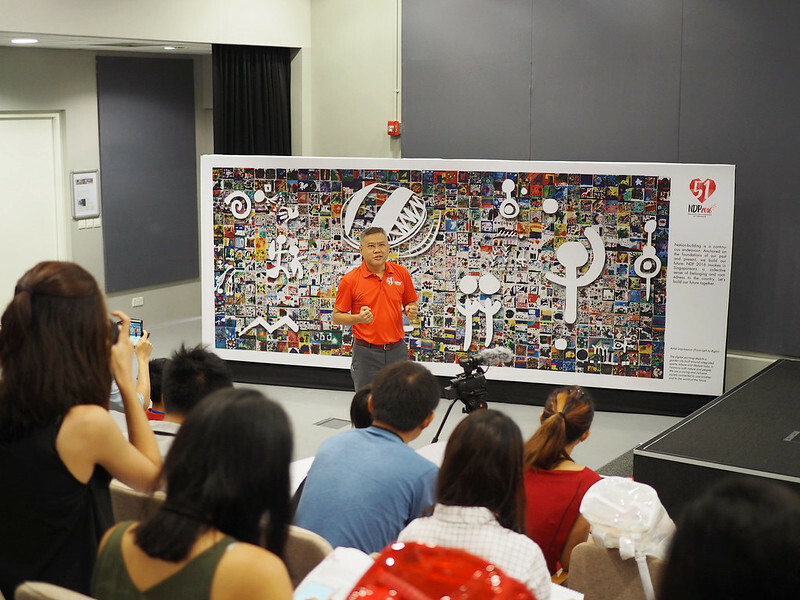 The resulting Pledge Card seeks to encourage Singaporeans to similarly reflect on what it means to be Singaporean, articulate their commitment to the nation and share how they can put these into action to build our Singapore of tomorrow. This initiative serves to remind Singaporeans that nation-building is a continuous endeavour as we work to build our future together." 2016 marks the first chapter of the next 50 years of nation-building and our journey towards SG100. In line with the forward-looking theme of “Building Our Singapore of Tomorrow”, the NDP 2016 Funpack bears a distinctively bold design to encourage Singaporeans to take bold steps in shaping our own future. The translucent skin of the Funpack – a first since the inception of NDP Funpacks in 1991 – is central to the bold design. The Funpacks come in the colours of our State flag, and serve as a reminder to be rooted to the values that define our collective strength and harmony. The media event ended sooner than expected and together with my fellow girls, we can't possibly miss our chance in getting a 'photoshoot' together right!?!? Hahahaha here's us with our coordinated coloured NDP 2016 Funpacks!! I honestly think this year's funpack is possibly one of the prettiest ever!! It is clean, simple, chic, waterproof (I am totally bringing this to my next beach vacay!!) plus it's so versatile! 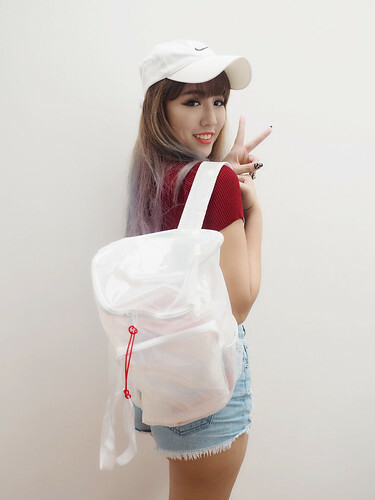 It can either be used as a backpack or as a sling bag! 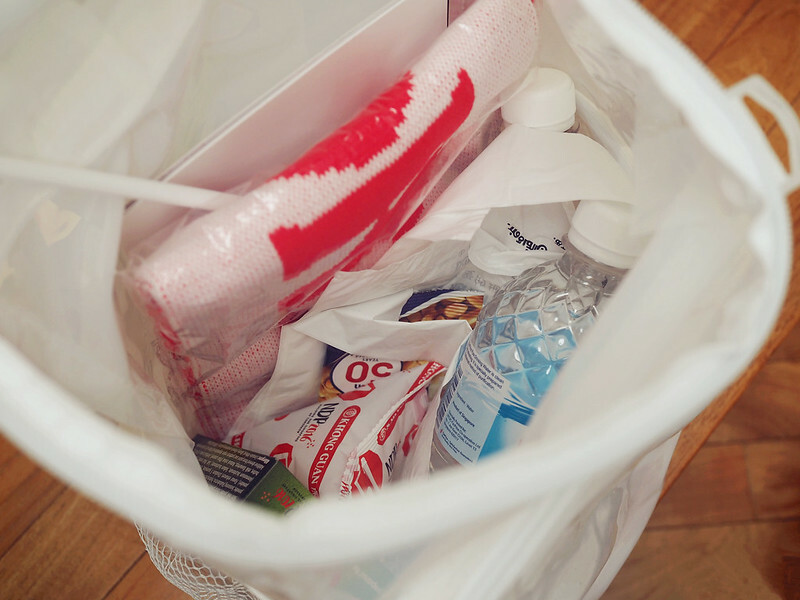 So now, you must be wondering.... What's exactly is inside the NDP 2016 Funpack!? NDP 2016 will leverage technology to present a refreshed NDP experience that seeks to promote active audience participation. 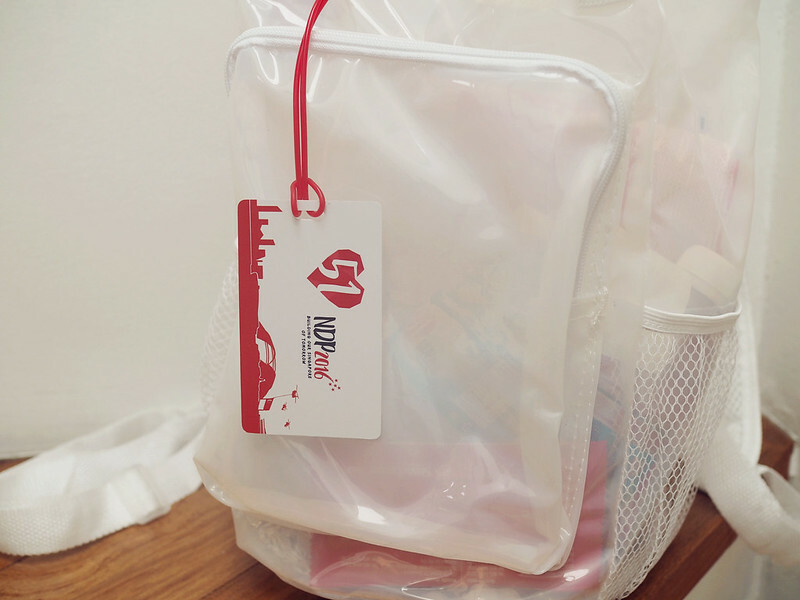 Each Funpack will contain selected interactive items which aim to engage spectators before and during the show. LED Wristband. The LED wristband is programmable and can be wirelessly synchronised with the show’s lights and sounds. It is capable of emitting lights with varying intensity, in 16 different colours and modes (i.e., pulse, fade, solid and strobe). In wearing this LED wristband, every spectator effectively becomes an integral part of the show, collectively contributing to massive visual displays and being able to enjoy a truly immersive experience. Souvenir Magazine. The souvenir magazine is embedded with digital content that aims to engage readers in an interactive way. 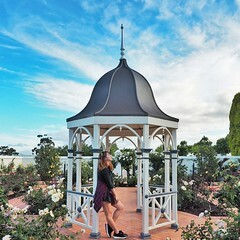 With the use of augmented reality, readers can access additional content – such as images and videos – using the NDPeeps App on their mobile devices. For instance, readers will be able to view a 3-D time-lapse video of the National Stadium’s evolution by focusing the camera of their mobile device on a picture of the National Stadium in the magazine. The mobile device’s in-built motion tilt and accelerometer sensors allow users to pan and zoom during this 3-D time-lapse video, allowing the spectator to appreciate different perspectives of the transformation of the National Stadium.